The second book of the Cainsville series was a massive disappointment for me. 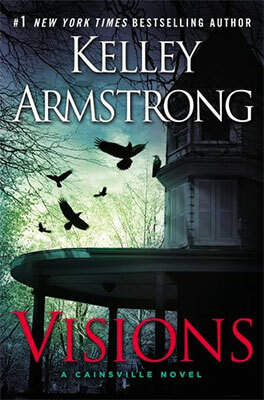 Even though Visions had much stronger urban fantasy elements than Omens, which I enjoyed, it almost completely set aside the overarching story about the Larsens’ convicted murders. Instead, Visions sidetracked in two unexpected directions: a love triangle involving Olivia and a brand new crime investigation, pretty much unrelated with the Larsens. Ugh. In Visions, everything revolves around Olivia: men fight to seduce her; people kill to threaten her; mysterious creatures try to lure her into choosing their side. The characters introduced by Omens are still there, especially the ambiguous though utterly fascinating Gabriel, but they recede to the background. Visions felt a bit single-minded compared to the first book. In particular, it focuses on Olivia’s love life: Olivia’s coming to term with her ex James and making out with her new boyfriend in the wild (not a joke). Not only I found the romance a misfit (do you really want a new boyfriend a few days after splitting up with your fiancé, learning you were adopted and that you’re biological parents are serial killers? ), but I also found it particularly unmoving, unexciting, and rather unsubtle. Unfortunately, I wasn’t impressed either by the crime story. It only continues the Larsen story in the most remote way. The book introduces a new murder of occult appearance, seemingly meant to scare Olivia away from her biological parents’ case. In Visions, I found Olivia rather passive: too often, the plot is pushed forward by external events and she just follow the lead. When something happens, Olivia calls for help (usually Gabriel) and that’s how the plot goes forward. Nonetheless, I enjoyed Visions‘ developments about Cainsville and Olivia’s special skills. More than investigating on the murder, Olivia investigates on the town, its history and its inhabitants. Even though the book remains blurry on many of the fantasy aspects – including on what makes Olivia so special – it does provide a few answers about the root of Cainsville and its strange customs. We also learn more about Olivia’s adoption and Gabriel’s childhood. Not enough, unfortunately. So, well, Visions was not the most satisfying read. I was disappointed by the plot, which felt like a sidetrack from Omens, and I simply couldn’t stand the romance. I was a bit frustrated by the style: overly casual, with extremely quick, short chapters usually ended with an artificial punchline. It did better than Omens on the urban fantasy side but still left a lot of questions unanswered. In short: it was so-so.